- A free shuttle service both to and from the greyhound/amtrak station...and now mega bus too! Just call us once you arrive and we'll pick you up within 15 minutes! - A free breakfast of pancakes, tea, and coffee (none of that 'continental' nonsense here!). - Free use of a guest computer and wi-fi. - A fully-stocked kitchen for your cooking needs. - a courtyard armed with a grill and outdoor games. - The cheapest rates on beds in both dorm and private rooms. - The convenience of staying just one block off charming Magazine Street, only a five-minute walk away from a super-wal*mart (the most convenient thing you can have next to you),the most beautiful parts of the garden district, and the St. Charles streetcar line that leads directly to the legendary Bourbon Street. Office hours are from 7am-12am. If you will be arriving outside of office hours, please contact the hostel before your arrival. Please note that if you are arriving after 12am, you will be charged an additional $5 for after hours attention. Please be accurate on your arrival time. If you are going to be over 2 hours later than your scheduled arrival time, please let us know, or your reservation could be subject to cancellation. To use our free shuttle service (available between 8am and 8pm daily), please call us when you arrive at the greyhound/amtrak station, or mega bus. Since trains and buses are not always on time, we do not schedule appointments for pickups. ***Students dorm beds can only be booked by STUDENTS *** If you are not in possession of a current student id or a foreign passport- you will not be allowed to check into a dorm bed! Reservations must be cancelled a full 48 hours ahead of time. All cancellations must be submitted via email. In the case of a late cancellation, the first night of the reservation is charged. Rooms on holidays - Mardi Gras, Jazz Fest, New Year's, Halloween, or July 4th - must be booked for a minimum of three nights. All cancellations for holiday rooms must be made 7 days in advance or the balance of the reservation will be charged. If you are driving in, Google Maps provides accurate directions to our address: 1660 Annunciation Street, New Orleans, LA 70130, in the trendy Garden District area. There is free and safe street-side parking. Options for transportation from the airport include a taxi ($33 flat fee) and the New Orleans airport shuttle ($20). If you are taking the New Orleans airport shuttle, be advised that it will not drop you directly at our hostel. 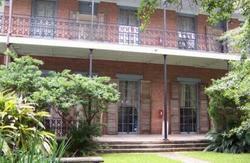 Ask the shuttle driver to drop you off at St. Vincent's Guest House, which is very close to us. When you get there, walk down Magazine St. to Felicity St. and turn left. We are on the corner of Annunciation St. and Felicity St.
You can also take the E2 Bus straight into downtown New Orleans if you don't want to go directly to our hostel. From the city center, you can take the St. Charles Streetcar line to Felicity St., and then turn left on Felicity St. We are at the corner of Felicity St. and Annunciation St.
Why would you do that? We provide a free shuttle service from Union Station between 8am-8pm! To use our free shuttle service (available between 8AM and 8PM daily), e-mail us with your arrival time, and then please call us at 1-504-644-2199 once you arrive at the Greyhound or Amtrak station. Since trains and buses are not always on time, we do not do appointments, but letting us know your arrival time does help us plan so that we can pick you up when you call. BUT I WANT TO WALK FROM THE BUS/TRAIN STATION! OK, fine! It is 1.4 miles and will take you about 30 minutes. 1. Exit station by the taxi stands and continue straight, keeping the highway on your right. 3. After roundabout (Lee Circle), Howard Ave changes names to Andrew Higgins Dr. Continue on Andrew Higgins. 4. Turn right on Magazine Street, after passing Nat'l WWII museum. 5. Continue on Magazine St for 12 blocks (approximately). Take a left on Felicity street. 6. The first stoplight will be Annunciation Street. We are located on the far left corner of Annunciation and Felicity (#1600). Look for the RV! I WANT TO TAKE PUBLIC TRANSPORTATION FROM THE BUS/TRAIN STATION! 1. Exit station by taxi stands and walk straight, keeping the highway on your right. 3. At roundabout (Lee Circle, with the statue), turn right onto St Charles Avenue. There is a streetcar stop between the roundabout and the highway. Take the closer streetcar, headed under the highway. It costs $1.25 per trip (or you can purchase a $5 day pass once aboard). 4. Exit streetcar at Felicity Street. There is a Wal-greens on the right corner. 5. Take a left onto Felicity (away from Wal-greens, past Regions bank) and continue on Felicity for 1/5 mile until you come to Annunciation Street. We are located on the far left corner at the intersection of Felicity and Annunciation. CREDIT CARDS: In order to save guest money, and comply with recent security measures to protect your card use- we no longer accept credit cards for payment at the desk. Previously a 3.9% merchant fee applied. We now have installed a ATM in common room that allows cash withdrawals for only $2.50 per transaction.